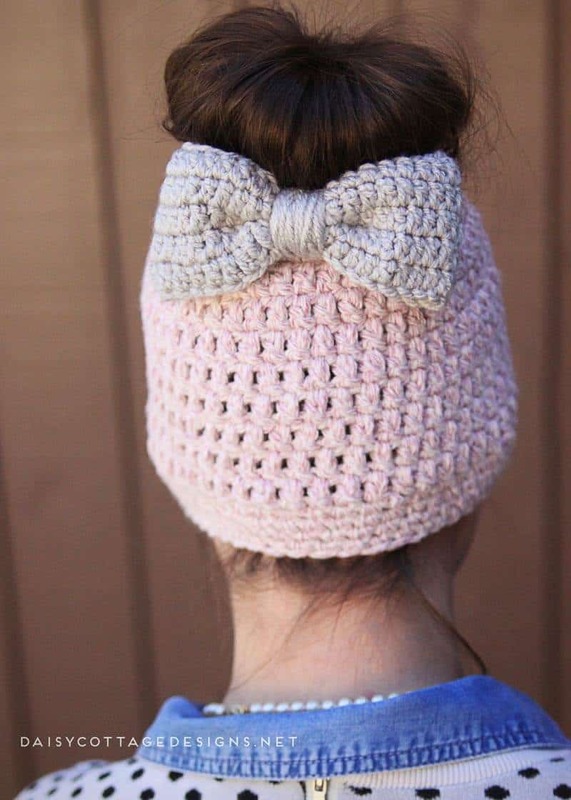 Since I posted the messy bun crochet hat patterns earlier this month, people have been posting requests for variations. The request I’ve heard the most is for a chunky version of the hat. Since winter decided to come to Florida for a day and a half, I decided now was as good a time as any. At least my friend didn’t sweat to death during our photo shoot. Add it to your favorites on Ravelry. I’m not 100% sure, but I think this one might be my favorite yet. I love the pink yarn that’s slightly variegated. I definitely plan on making a scarf out of this soft, beautiful yarn (yarn info listed in materials section) in the near future – maybe a cowl with a cute fringe. My friend Danielle was wearing an adorable chambray shirt and the cutest polka dot sweater you’ve ever seen. I love how classy and sleek the messy bun hat looks along with her outfit. 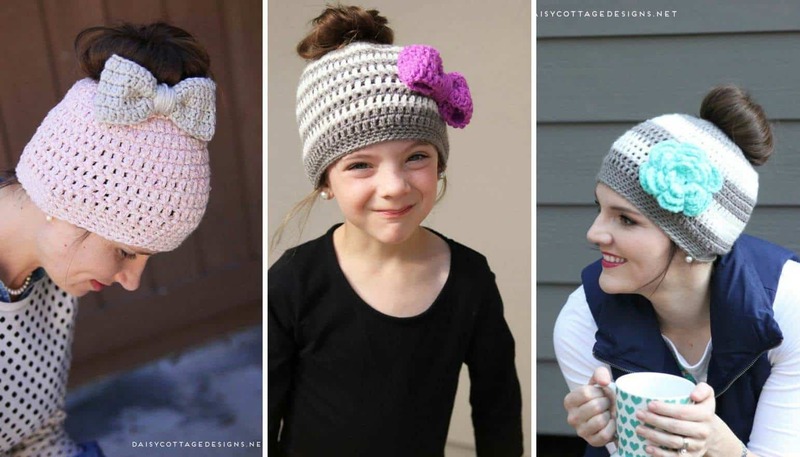 If you want to make this crochet hat pattern for yourself, you’ll be happy to hear that it’s simple. 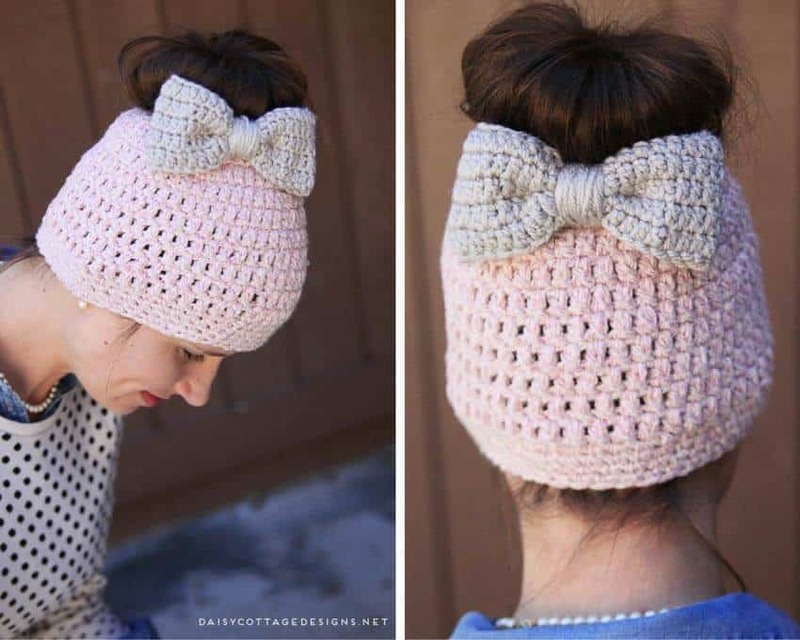 I didn’t make this hat in one sitting, but I’d say it takes about 45 minutes for the average crocheter. If you have questions about how to start this pattern, this post will be helpful! This pattern is worked through both loops. VERY IMPORTANT! There is an extra DC worked into each round so you don’t have to sl st to the chain at the end of each round. This makes your seam less noticeable. If you work into the top of the ch 2, you’ll gain stitches each round so be very careful to sl st to the top of the first DC when you’re joining your rounds. 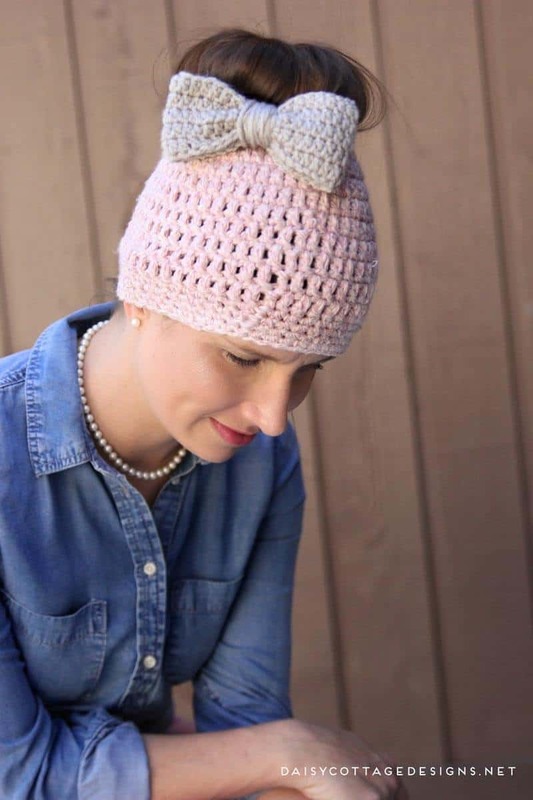 Without further ado, here’s the newest free crochet pattern from Daisy Cottage Designs. To begin this pattern, ch 20. Sl st in the first chain to make a circle. If you want, put a hair elastic on top of this chain loop and work around both in round 1. This number is not set in stone so if you feel like you need a larger opening, you could add a couple extra chain stitches. Round 14 (or 15 if you did an additional sc round): 1 sc into the same stitch and in each stitch around. Sl st to the top of the first sc. Cut yarn and weave ends (48). You’ll notice there are some optional rounds in this hat. The way I made it, I have 4 sc crochet rounds as a border. If you don’t want your border so wide, you could leave one or two out. Also, if you find as you’re going that 15 rows is going to be too long, you could cut out one round of dc and start your single crochet rounds after round 10. I absolutely love the bow on this particular hat. It’s a simple touch, and it can be worn in the front, in the back, or on the side. So many options! You could also embellish it with a flower or leave it plain. The embellishment is a free crochet pattern, as well! 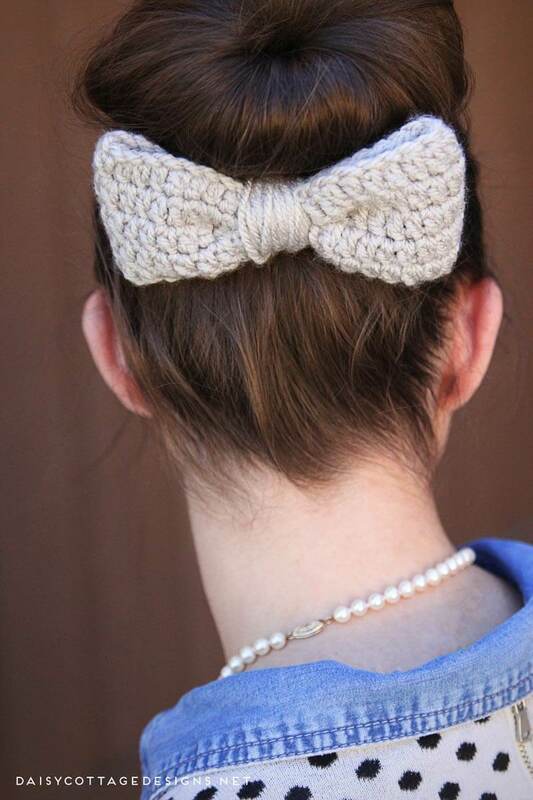 I used the large version of this crochet bow pattern to embellish this messy bun crochet hat. Attach it to an alligator clip and wear it alone or with the hat! Very cute! 🙂 Gotta love bows! I love your patterns, but having a hard time printing any out , so I don’t have to set at the computer all day while crocheting.. I have to highlight the words then right click then print , and the same with picture so I can keep them in my binder . Am I missing something or does everyone have to do this. Hi! Working on this adorable hat right now! I believe I found a small error in your pattern, though. Rows 5-10 should chain 2 after slip stitching to the previous round. Only Round 11 should be dc, but chain 1 at the end to go from a dc row to an sc one. Thanks for the lovely pattern, just wanted to submit the suggestion. Thanks, Kim! I’ll check that out and make the change. 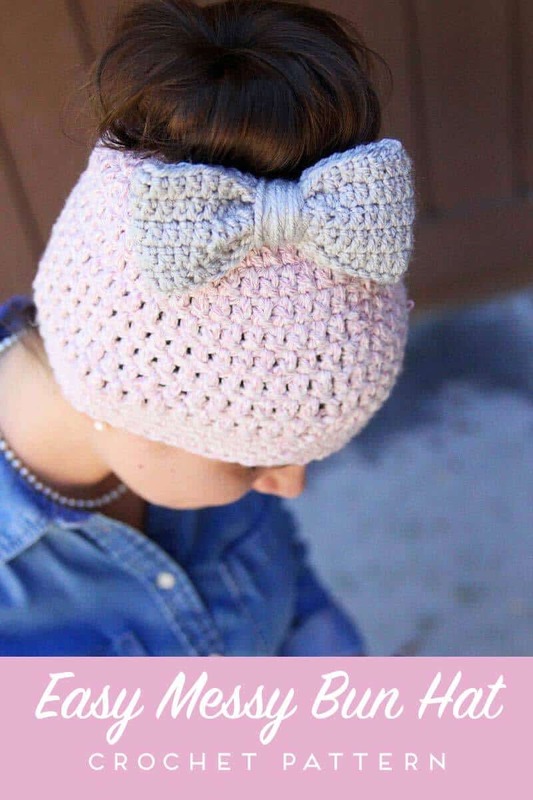 The bow pattern is available here. Hi. You mentioned in your other pattern about the difference if one wears their bun “straight up” on top of their head vs slightly toward the back. Can you add those instructions again on this pattern? Is that to adjust the length of th hat so it won’t come down too far down over your forehead and into your eyes? Thanks I love this and want to do for my daughter. Yep, Sandi. It’s the same. This hat is actually a little shorter as it’s written. I’d just make the hat and see how it goes. Since there’s no stripe pattern, it’ll be easy to switch to the single crochet rounds when you think the hat is long enough! Thank you for an awesome pattern! I made this in adult and was wondering if there were any modifications I could do to make it in a child size? I did see the link for the child one but was wondering about making this same one in a child size? If not, is there a different way I can start the child one where it’s not worked into the hair tie? Thanks!! Hi, Katie. I’d start it the same way 🙂 Um… I haven’t worked it up for kids, but I’d say 18 or 21 stitches in round one. Oh brother. That’s a loaded question. I have a formula that I use for pricing my handmade items here. 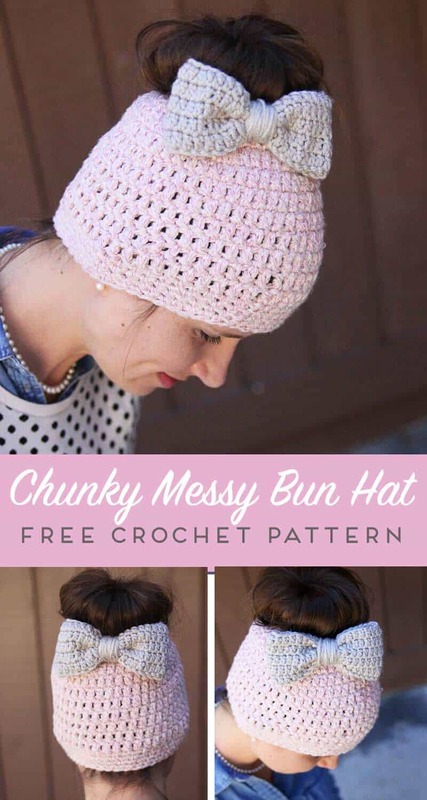 I’ve been looking for a cute messy bun hat to make and there are so many out there now. I was scrolling and this one caught my eye. its so cute and the bow is what caught my attention. I will be making this one right away after I finish making Carolina Panthers hat for my co-worker. i also love the blue and white one with the flower. for sure will make them both! I absolutely love how easy for patterns are to follow & how beautiful they turn out. Thank you!! I do have a question about the alligator clips for the bow. What do you use & do you get the ones without teeth? I think the large clips always come with teeth?! Those are the only ones I’ve seen anyway 🙂 Those work well. Thank you so much for sharing this pattern!!! I love it!!! Thanks, Doreen! I’m so glad! Really great instructions! Thank you so much! I LOVE this one!! It took about 30 minutes. Fabulous. Love the bulky yarn option! I repeated round 4 until row 10 instead of 11. And then crocheted row 12 (11 for me with the same main color) and changed row 13-14 (12-13 for me) to a new color. Super quick, super easy, super wonderful! Permission to sell finished products? Yay! Glad you enjoyed it, Bess. Absolutely – sell away!